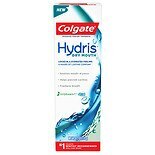 Shop Colgate Hydris Dry Mouth Toothpaste Mint (4.2 oz. )4.2 oz. $699$6 and 99 cents$1.66 / oz. 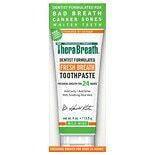 Shop TheraBreath Fresh Breath Toothpaste Mild Mint (4 oz. )4 oz. $1149$11 and 49 cents$2.87 / oz. In a healthy mouth, the salivary glands are constantly at work manufacturing and releasing saliva into the mouth. Saliva plays a number of important roles in the anatomy of the mouth. It contains enzymes that help break down food when you chew, beginning the process of digestion. Certain minerals and natural chemicals present in saliva fight bacteria that cause bad breath and that contribute to tooth decay. Additionally, saliva lubricates the gums and the lining of the mouth, helping to prevent irritation. Because saliva performs so many important roles in oral health, those who do not produce enough of it can suffer many oral health problems. Chronic dry mouth can cause numerous symptoms, including sores inside and around the mouth, bad breath and trouble swallowing. If allowed to persist, dry mouth increases the risk of many oral health problems, including tooth decay and gum disease. While there are many underlying conditions that can cause dry mouth and require addressing to ensure tooth and gum health, using dry mouth toothpaste can help to alleviate symptoms of dry mouth. Dry mouth toothpaste products are created to help those who suffer from chronic dry mouth brought on by the normal effects of aging, the use of prescription medications or a medical condition like diabetes, or Parkinson's disease. Toothpaste intended for dry mouth sufferers can function in one of a few ways to promote good oral health. Some products contain fluoride and other ingredients that can strengthen the dental enamel, helping to protect the teeth from the tooth decay that can occur due to the condition. Others contain ingredients that help to stimulate saliva production to provide more lubrication for the mouth. Many formulas contain ingredients to neutralize bacteria and to freshen the breath. Manufacturers of dry mouth toothpastes offer their products in a variety of flavors to suit your palate and make brushing as pleasant as possible. In the dry mouth toothpaste collection at Walgreens, you'll find many options to meet your needs, help you feel more comfortable and enjoy improved oral health despite chronic dry mouth.